Wendy Pini, along with her husband Richard Pini, is the comic creative team known as WaRP. They are responsible for creating the wildly popular Elfquest series. Through the mid 70s, Wendy Pini become infamous for appearing at comic conventions as an actress/dancer in The Red Sonja and the Wizard Show. 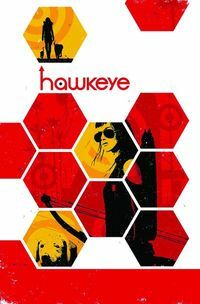 This led to her first professional comics work, writing an issue of Red Sonja for Marvel Comics. However, she’s also written and painted two critically-acclaimed graphic novels based on the hit TV series Beauty and the Beast. Additionally, she created text and illustrations for Law and Chaos, an art book inspired by the writings of Michael Moorcock. And in 1997 Wendy Pini designed the elfin mascot for the Enclosed Laminar Flames investigation (ELF). This was an experiment performed in space by members of the crew of Space Shuttle Columbia. Subsequently from 2007 to 2010, she focused on her darker side. The result was an adults-only graphic novel based on the classic Edgar Allan Poe horror story Masque of the Red Death. Her animated web comic of the same name has received millions of views. It is currently available as a limited edition, 400 page hardcover collectors volume. In 2012, along with Richard, Wendy donated her entire body of work to Columbia University NY Library’s archives. Her artwork and writings are permanently available to students and the public for study. In addition, Wendy also completed the book and lyrics for a musical adaptation of Masque of the Red Death. In November 2014, two songs from Masque were performed at the Kennedy Center for the Performing Arts. What happens when a professional illustrator and an MIT astrophysics major start talking comics? In the case of Wendy and Richard Pini (better known as WaRP), they get married and team up to create ElfQuest, one of the longest running cult series in comics. 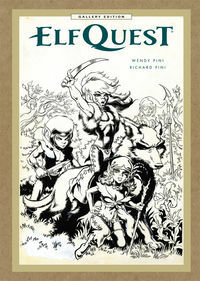 The first ElfQuest story came out in 1978 and set on planet Abode. The ElfQuest protagonists are tribes of elves descended from an advanced humanoid race of aliens. They were stranded on Abode thousands of years ago while exploring the Universe. These elves were looking for a new home as resources on their home planet were dangerously near depletion. 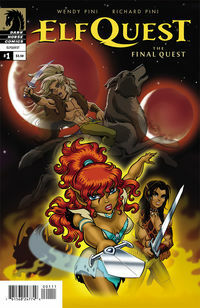 The Complete ElfQuest, Volume 3 trade paperback comprises ElfQuest: Hidden Years #1-5, ElfQuest: Hidden Years #8-9.5, and the entire ElfQuest: Dreamtime series. 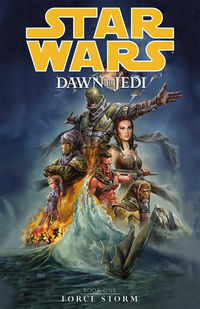 The more than 400 page book is also a cover gallery and includes commentary from original creators. The Hidden Years vignettes add depth to some of the characters from previous works. A standout chapter is Little Patch. In the story, an elf takes in a human child found abused and abandoned in the woods. It is sad and heart wrenching to watch a human raised by a tribe of immortals. But the story is beautifully told and illustrated. The Dreamtime series is a collection of the elves’ prophetic dreams from their ten thousand year sleep. While the elves slept in their protective cocoons, the world drastically changed. Now, cryptic dreams must be pieced togetherin order to survive and reunite the elf clans. 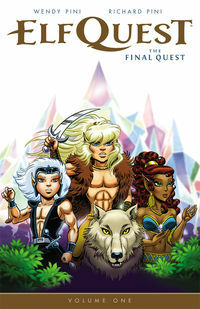 RESERVE YOUR COPY OF THE COMPLETE ELFQUEST VOLUME 3 TPB. Long time ElfQuest readers will feel the Pinis’ touch throughout this collection. Only one of the stories was not written and illustrated by the husband and wife duo. Readers new to the series should appreciate the episodic format of this volume. The individual chapters give a look into the world of ElfQuest, without forcing the reader to have intimate knowledge of 38 years worth of material. ORDER THE COMPLETE ELFQUEST VOLUME 1 TPB AND THE COMPLETE ELFQUEST VOLUME 2 TPB.